Drain fields are essential to the health of your septic system. As the household waste travels through your septic system, it ends up in the drain field. Once waste in the septic tank is broken down and digested by affluent bacteria, it is expelled into the drain field. With such an important role its essential to know more about this part of your system and to know the signs of drain field problems. Why are Drain Fields So Important? In the drain field, waste from the septic tank will be processed again and eventually released back into the ground and into the community’s water table. Drain fields are made of perforated pipes that allow water to escape into the soil or gravel. Not all drain fields are the same and can use different ground materials. As wastewater trickles from the septic system, it passes through the various layers of gravel or dirt. These different layers absorb the water and filter out hazardous contaminants. Drain fields, like other parts of your septic system, can age or have problems over time. A drain field problem could either mean it needs repairs or it needs to be replaced altogether. Unfortunately, there is no definitive way to diagnose this issue without examining the different parts of your septic system. You’ll have to call your trusted professional to confirm the problem. But, noticing the signs of drain field problems early will help you solve the issue faster. What type of symptoms should you look out for? Soggy spots in the yard are a possible sign that you have a problem with the drain field. This could mean that you have a crushed pipe or a clog. Or, perhaps the soil and gravel are not treating the wastewater properly. If this is the case, then you may need to replace these materials. However, this could be a sign that you have a problem with other parts of your septic system. It could mean that too much water is coming from the household and reducing your water usage could fix the problem. It could also indicate that the septic tank needs to be pumped. A drain field should only see liquid. No solids! If you notice a dark sludge that smells like sewage, it probably means that bio-material is passing into the drain field. This is bad. This is an environmental biohazard. You do not want to release raw waste back into the environment. It can contaminate the local water source. Additionally, it can wreak havoc on your drain field as well. Anytime that you notice a sewage odor inside your house, you should contact a septic professional. Why? Because it could mean sewage is entering your home. Sewage brings contaminants that can make you sick. If you think that you may be experiencing this problem, it could be an issue with the drain field. A blocked drain or pipe could cause a back-up, which could eventually need repairs. However, this too could be a quick fix if it’s a problem with the septic tank. Don’t misdiagnose the problem. Call a professional. It will save you money in the long run. Greener grass in your yard or drain field could mean that your property is experiencing more raw waste. The nutrients from this waste act as a fertilizer for plants. Plants that are greener than usual are thriving on the new nutrients. So, if you historically are not the family member with a green thumb, it could be time to call your trusted septic professional. Most of the time problems with toilets and drains are issues for a plumber. But, sometimes they are signs of a more significant problem. Problems with flushing or slow drainage could mean that there is a block in one of the pipes. Water backup in toilets and drains is not normal. These issues usually signal a clogged drain or full septic tank. However, if drain field pipes become clogged, this issue could back up the rest of the system. If wastewater is not released from the septic system, it will find another way out. This could be your house. Remember sewage in the house is a danger to you and your family’s health. Roughly, a drain field will last around 20 years. An older or overworked drain field will eventually need replacing, sooner rather than later. This procedure will be costly and time-consuming. 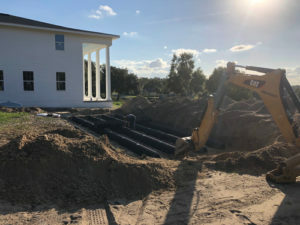 The state of Florida has standard regulations that must be met when a drain field is constructed. See section 64E-6.014 of the administrative code for more specifics. So, you don’t want to replace your drain field unless absolutely necessary. Your septic system is made of several parts, and perhaps only one component needs to be replaced. 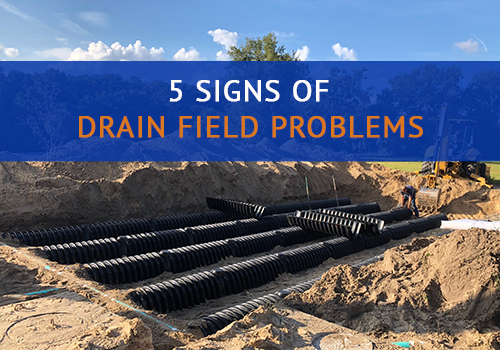 Problems that show up in the drain field do not always mean that the issue is from the drain field, but they could be warning symptoms. So if you see any of these signs of drain field problems, call in the professionals. Calling a professional to inspect your system could save you money and time. Contact us at Advanced Septic Services.